We prune trees with a variety of goals in mind. These goals include improving appearance and structure, reducing potential hazards, and promoting tree health. Pruning may be an acceptable way to control an existing insect or disease problem without using pesticides. Pruning can also increase light penetration and airflow through a tree's canopy, thus making the conditions less favorable for fungal disease. However, for some tree species, pruning at the wrong time of year may actually promote certain diseases. 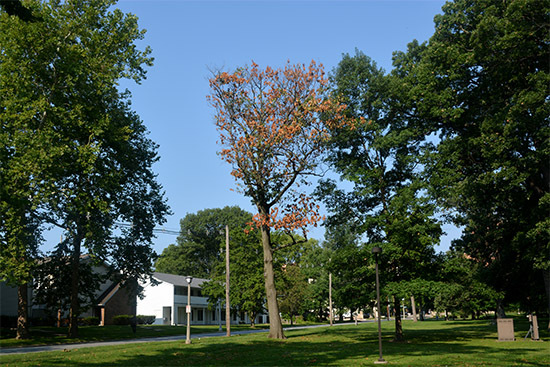 Oak Wilt and Dutch Elm Disease (DED) are examples of two devastating fungal diseases that are more likely to occur on host trees pruned early in the growing season. Fresh pruning wounds attract the insect vectors that transmit these diseases. Once in the tree, both diseases are capable of rapidly killing their host tree, often in a matter of weeks. We can help prevent the spread both diseases by postponing maintenance pruning on at-risk trees until the dormant season. Avoid pruning elm and oak trees, especially the red oak group, from April to October. In Illinois, oak wilt is at the highest risk of spreading during April, May, and June. While the risk of infections via pruning wounds may decrease by mid-July, those erring on the side of caution should choose to postpone any pruning until dormancy.